Shardul Pandey Talks is universal program for promoting those individuals, who sign-up for free SANGKRIT.net account towards developing a domain of Internet as their private property and create virtual wealth in webspace so if you too want to get interviewed, simply email to shardulpandey@sangkrit.org considering any conversation upon this as subject to publication here. Old media works through middlemenships while using WordPress truly activates free press across all time zones in individual domains so are you ready for finally replacing freedom of press by freedom of domains since freedom of press expresses only outdated jargon reflecting an already past era when pressing was needed to print? Domains registrants always did far better than so-called sovereign nations ever did for protecting user information so do you agree to acclaim sovereignty of domains for ascertaining integrity and independence of internet? What Ladar Levision could do with lavabit.com as individual owner of domain, can google.com registrants ever do same being publicly traded company? Publicly owning a domain creates a lot of legal confusion in the way of expressing your true self so isn’t it a lot better to stay an individual netizen in the battle of individual freedom and social privacy? Do we require developing an international law that can make sharing user data from any domain an international crime? People always buy convenience by even paying back their freedom but how to differentiate corruption and cooperation in business? Why by joining in to old formats of organizations that demand ultimate sacrifice of individual opinion and independent behavior, human-being can never be winning any battle of individual freedom and social privacy? Technologically what next we should be doing for strengthening individual freedom and social privacy of humankind? In what format we should be designing wearable personal media to create augmented reality live by replacing wristwatch, goggle, hat, belt, stick and sports shoes? How to get energy packets transmitting in a wireless manner without travelling through human bodies? How to lead humanity beyond Internet Protocol by developing an Inter-Personal Protocol facilitating peer-to-peer functioning among all devices without centrally registering anything at all? How could we be unleashing a globally distributed order of man and machine? Do we require freedom to have telecom satellites without any government regulations about it? Why the client-server architecture of internet protocol deserves getting replaced by peer-to-peer architecture of inter-personal protocol? Why without developing p2p technologies as most convenient way of doing things individual independence is technologically impossible? How would you like configuring a freedom course for kids coming online to make them understand the value created by GPL for pursuing peer-to-peer engineering? What do you think about the freedom of domains through the onion routes (or by legislation) in p2p mobility of internet with android at the core? Not necessarily you require answering any question from above but you may ask yours also. Ask anytime any question that might help you in establishing your domestic entrepreneurship on your domain. You are always most welcome to do so. 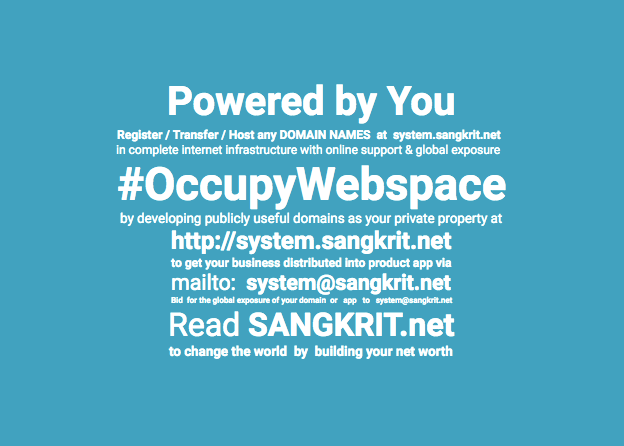 ‘Shardul Pandey Talks’ is always open to help everybody registering a domain to create value in webspace. Thus the path of progress could get followed in a user-friendly way by anyone anywhere on planet earth. encourage women through all social environs across all time zones for registering domains in individual names and using WordPress as free press for domestic entrepreneurship accessing global market. encourage p2p mobility through the onion routes for freedom of internet. discourage people from joining any organization since it is always so disrespectful to individual freedom. discourage people from organizing any local event since local events, despite being so expensive, leave so little impact comparing to internet events such as ‘Shardul Pandey Talks’. Moreover I discourage master-servant relationship in society along with client-server architecture of world-wide-web. Shardul Pandey Talks is primarily focused for changing this world to make it much better abode of humanity because it really helps individual human-beings in determining their destiny. A few days back Jimmy wales called for making encryption a human rights issue. I asked Keith about it but he said it was not even worth discussing. Now all of you must have come to know about shutting down instance of lavabit.com followed by Silent Mail also. A war is waged on encryption and for encryption. It is all about data retention for misusing it or no data retention and not even using it. I do not see any worthwhile role any government is going to play in all this battling. It is actually an internal struggle of two-lines in technology. Sometime back while talking to me RMS resolved for finally replacing all client-server architectures by p2p restructuring. Thus we thought about finally protecting humanity from PRISM type of entrapment, although Edward Snowden was still working for NSA then. That is truly a engineering challenge not less greater than once GNU had been. Technologically RMS has been a no-nonsense man all his life. It is history now that only he has begun the free code upon which whole world works now. The way android is Linux, Linux is also GNU. Once he personally took the challenge to bring in free software replacing proprietary patterns and today most of the internet works on it. Now if he has said so, it can be done also. RMS is always relevant even then when you log in to facebook. The right to mobility with connectivity is fundamental human right along with a right to encryption. Connectivity creates value of humanity and encryption keeps it humane. Neither I nor you but we are Internet.